Bespoke garments are handcrafted using individual hand stitches and hand cut on the premises, a master pattern is made for each individual customer and fittings are usually given. The suits themselves have approximately 5000 individual stitches and the 'body' of the suit is built up using canvas, which is hand sewn into the cloth to create the correct shape. Made to measure garments are beautifully tailored and styled to fit you using machine sewing and cutting. Samples sizes will be used to get your measurements, occasionally actual body measurements will need to be taken. Made to measure suit jackets are made using a bonding technique for the canvas application and normally have no fittings. How long does it take to make the garments? Bespoke suits and dresses will usually take 6 to 8 weeks to complete. Made to measure garments take 5-6 weeks to complete. Bespoke shirts and blouses take 3 weeks. How many times will I need to visit? For made to measure garments you will need at least 2 visits; you will have your initial visit and then a visit to try the on the garments. If we are all happy with the fit and no final adjustments are required, you will be able to take your garments home. For handmade garments you will require a fitting, therefore you may need 3 to 4 visits. Once a master pattern has been made for you, then all future garments can be made straight from your pattern and no fitting is required. Why do some cloths cost so much more than others? The finest cloths are generally more expensive due to the manufacturing techniques used to get the fabric so lightweight, whilst these are fantastic to wear and superb for occasional use, we do not recommend them for everyday office suits. We will advise you on the ideal cloth weight for the intended use of your garments. What is the difference between Made to Measure, Semi-Bespoke and Personal Tailoring? Put simply, nothing! These are just different ways of describing a suit that is tailored for you, which is factory made without fittings. I need an outfit for a special occasion but don't know where to start. Can you help? Yes! Laura and Natalie will spend time with you discussing what occasion you are attending, what you would feel comfortable in and offer advice to help you choose the right outfit for you. We send out information via email regarding new products or sales. Please email Laura Souster Couture to be added to their mailing list. 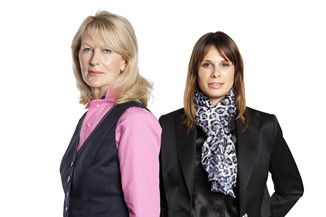 What is the difference between a ladies bespoke shirt and blouse? A bespoke shirt is usually worn for business wear, made from fresh cottons with a more classic full collar and cuffs and if you wish cuff links. Blouses can be worn more casually with softer collars and lower neck lines or for a special occasion made from feminine fabrics like pure silk and glamorous styling detail. What does 2 + 4 equal? 14 Bedford Street, Woburn, Bedfordshire, MK17 9QB. Copyright Sousters and Hicks 2012.